Ortho Sport & Spine Physicians is Atlanta’s leading provider of minimally invasive spine surgery and Endoscopic Discectomy surgery. We are an orthopedic and spine practice featuring a dedicated team of Interventional Spine physicians and orthopedic specialists who specialize in finding solutions to chronic and acute pain conditions and injuries. Our double board certified physicians are highly and experienced in performing minimally invasive spine surgery procedures, including Endoscopic Discectomy. By combining state-of-the-art technology and equipment with our surgical expertise, we are able to help our patients with herniated discs find long-term relief from their pain and other symptoms and return to an active and healthy lifestyle. Ortho Sport & Spine Physicians is pleased to offer expert minimally invasive herniated disc treatment to the residents of Atlanta and the entire Southeast. If you suffer from pain and other symptoms due to a herniated disc and non-surgical treatments have failed, you may be a good candidate for this outpatient procedure. Endoscopic Discectomy offers many advantages over traditional open back surgery including fewer chances of complications, less post-operative pain and a shorter recovery time. With Endoscopic Discectomy, the spine remains in tact and there is little chance of scar tissue development. This has important implications for the long-term success of the procedure. What is an Endoscopic Discectomy? An Endoscopic Discectomy is a highly effective and minimally invasive treatment that can be used to relieve the pain being caused by a herniated, protruded or extruded disc. The procedure involves inserting an endoscope into a small incision in the back under the guidance of a Fluoroscope to remove a small portion of the affected disc or to push it back into place. 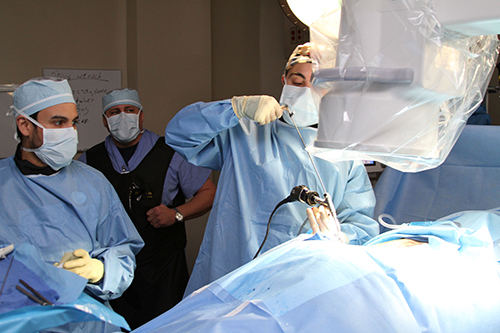 Endoscopic Discectomy is an outpatient procedure and takes an average of an hour to complete. 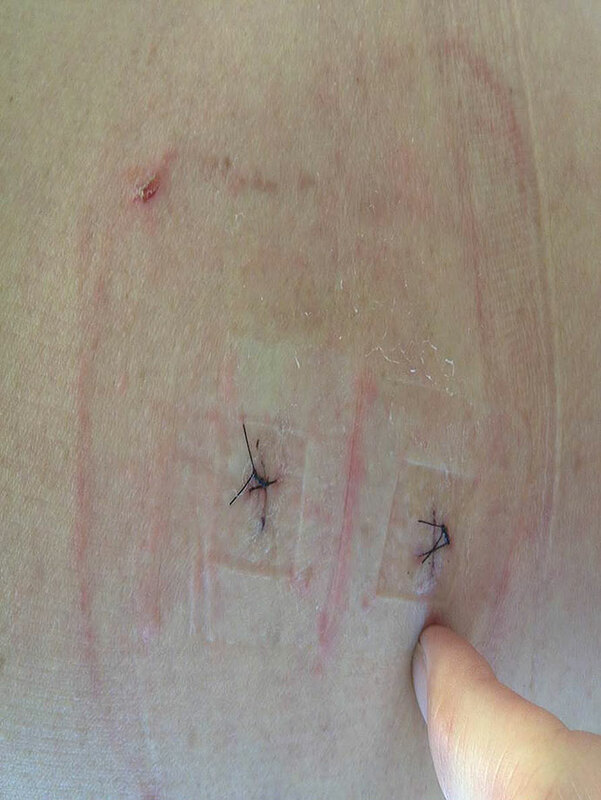 After the surgery, patients can return home with a small band-aid placed over the incision. If you would like to get more information about this procedure or to find out if you are a candidate for this minimally invasive surgical procedure, please contact the Atlanta Endoscopic Discectomy Specialists at Ortho Sport & Spine Physicians today and schedule a consultation with one of our Interventional Spine physicians. For your convenience, we accept most insurance plans as well as several other forms of payment. We look forward to helping you stay active and live your best life! Please note how small the incisions are, compared to my index finger. 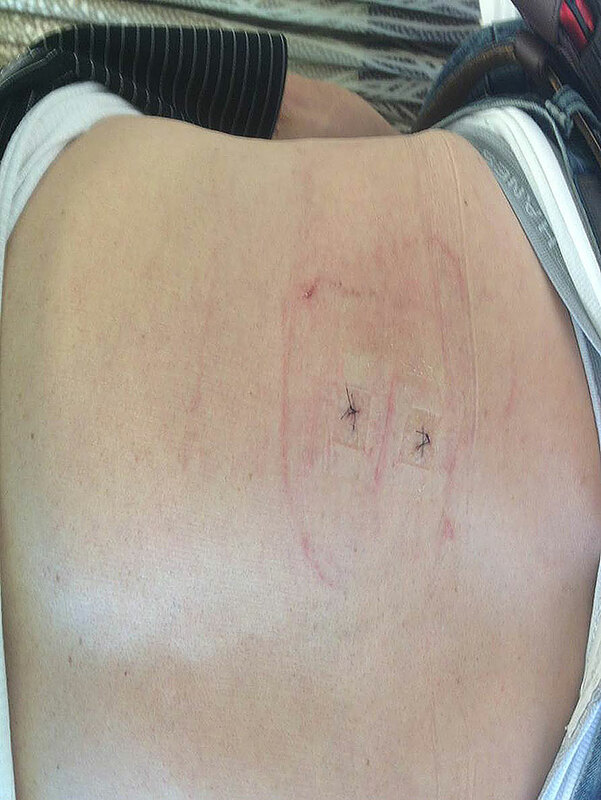 Remember: a traditional, open 2 level discectomy had a 5-7 inch long incision.